On Monday, developer Second Gear announced the release of Elements 1.1, a significant upgrade to the Dropbox-powered writing software for iOS devices. The new version incorporates a number of much requested features, including the ability delete and rename files, adjust sorting, and search. First released last month, Elements allows you to create text documents that are all stored in your Dropbox, and thus effortlessly synced between your devices. There were, however, some shortcomings in the 1.0 version of Elements, including an inability to rename or delete files that had been created. Fortunately, Elements 1.1 addresses those problems: you can now delete files from the main screen and renaming any document is as easy as tapping on the title bar while you’re viewing it. Those aren’t the only changes you’ll find in Elements 1.1; you can also sort to view your files either by name or by date last modified, and there’s also now the ability to search the entire text of all your documents. In addition, Second Gear also updated the app’s UI to be more subtle and smoothed out the process of creating a new document (it now takes you into an untitled document instead of prompting you with a pop-up box). And, of course, there are the usual minor bug fixes and improvements in performance thrown into the mix as well. Overall, the enhancements ought to go a long way towards making Elements an even more appealing choice for those who need to edit and write on the go. 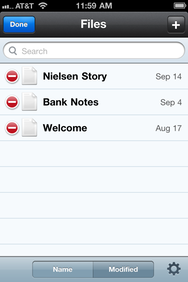 The app currently costs $5 and requires an iPhone, iPod touch, or iPad running iOS 3.2 or later.